Kortet mitt med den herlige lille dragen er mitt DT bidrag hos Creative Fingers #156. Digistemplet 'Dinky baby dragon' er fra vår flotte sponsor Morgan's Artworld. Hadde selvsagt ingen dies store nok etter jeg hadde drodlet og malt, så det er ganske enkelt, og jeg måtte prøve et litt annet format denne gangen for å få plass, ca. 21 cm bredt kort! Håper bare at jeg har store nok konvolutter ;) Som alltid har vi et 'Lag-hva-du-vil' tema, og velkommen skal du være! Jeg har en blogcandy som du kan være med på trekningen til ~ her ~ om du enda ikke har sett den! As always it is an 'Anything goes theme', and you are more than welcome to join with your creations. Elsker å male med akvarellmaling og lage egne bakgrunner til motivene ~ og drodle litt! Stamps/Images: Morgan's ArtWorld digistamp 'Dinky Baby Dragon'. 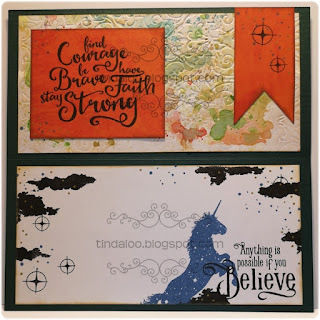 Visible Image clearstamps 'Unicorn Magic', 'Believe in Unicorns' & 'Stay Strong'. Papers: I prefer Canson Montvale aquarelle paper (200 g/m coldpressed) for my motifs. Bazzill cardstock. Plain white cardstock. Designerpaper by Rouge de Garance 'Jardin secret no.01'. Stencils/Embossingfolders: Anna Griffin 'Foundry' Cuttlebug embossingfolder. Essentials/Adhesives: Bonefolder. High-Tack Double Sided Red Tape (Red Liner/Stix2/Miracle tape). Wink of Stella clear silver glitter brush. Uniball Signo white pigment pen. Techniques/Mediums: I used misc. 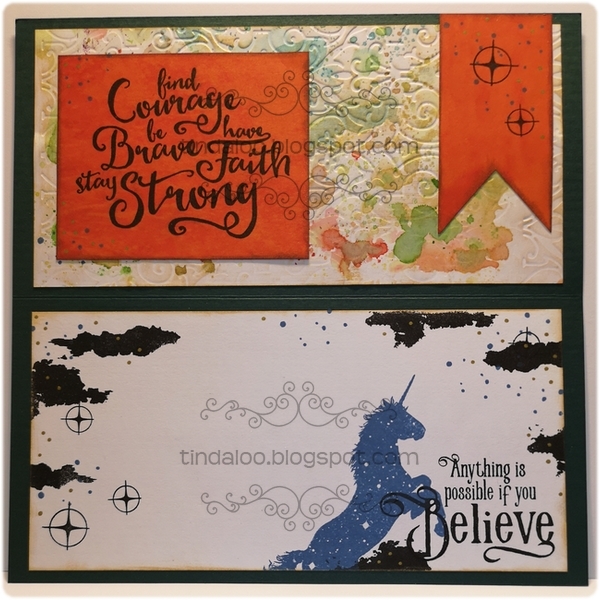 Tim Holtz Distress Ink pads both regular & oxides to watercolor and distress image and papers. Tsukineko Delicata ink cubes 'golden glitz' & 'celestial copper'. Panduro Hobby metallic gold pen. 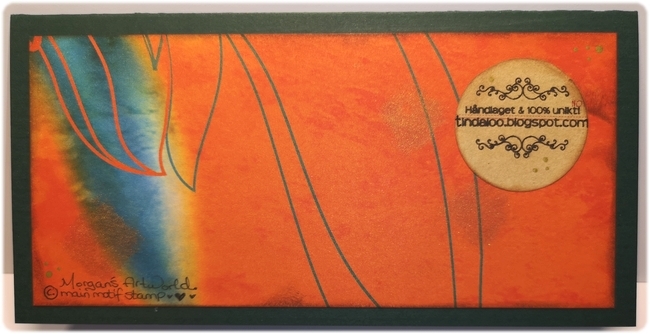 To heat emboss I used a Versamark inkpad, a heat gun tool & Hero Arts gold embossingpowder. 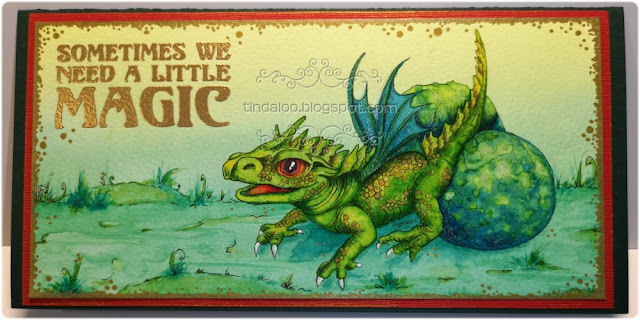 Fabulous and magical card! Your colouring is absolutely wonderful!!! Oh my goodness, what a fabulous creation, inside and out! Beautiful coloring on the dragon, WOW! Thank you for sharing with us over at Morgan's Artworld Open Challenge and best of luck with your entry. Love to see you join in each month. Thank you. Fabulous card! Love so much the whole design with this wonderful image. What an amazing card and so beautifully coloured. Look so very real. thanks for sharing at HLS thismonth. Så tøft kort og så fantastisk fargelagt! Incredible coloring and scene. Thank you for sharing with us over here at Morgan's Artworld Open Challenge and best of luck with your entry. Love to see you join in each month. Thank you. Vintage Glow in the Dark Alien! You're the cream in my coffee..
Lighten Up ~ Great things will happen!